Kurt Busch and his No. 41 Stewart-Haas Racing Ford won the pole for Sunday’s debut Monster Entergy NASCAR Cup Series race at the Charlotte Motor Speedway Roval. Running late in the final round, Busch toured the 2.28-mile, 17-corner course in 76.805 seconds (106.868 mph) to edge road-course ace AJ Allmendinger (76.846 seconds at 106.811 mph) for the top starting spot. 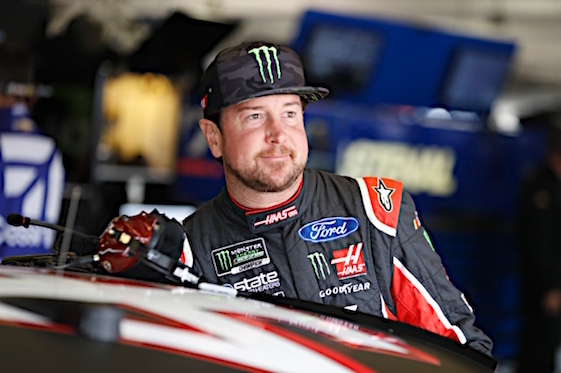 Busch earned his fourth pole of the season and the 26th of his career, after spending time on the Ford simulator preparing for the debut race. “This is really special to win any inaugural race or pole,” Busch said. “To have this little trophy next to me means a lot. It brings me back to my past, when you go into a new event and you’re a rookie, you have to execute with fundamentals and an open mind. Alex Bowman (106.800 mph) qualified third, followed by Hendrick Motorsports teammate Chase Elliott (106.596 mph). Both drivers are in vulnerable positions entering the Round of 16 cutoff race in the Monster Energy NASCAR Cup Series Playoffs. Playoff drivers Kyle Larson and Jimmie Johnson earned the fifth and sixth spots on the grid for a race that could feature a fair share of contact. “We’re going to see two races, I think,” said Allmendinger, who said he probably could have nit-picked his final-round lap and found an extra half second, provided he stayed mistake-free. “You’re either going to see everybody get so cautious because of all the accidents in practice, and people are on the cutoff line for the playoffs; or we’re race car drivers, and we’re not very smart and we just go out there and get crazy and tear up a lot of stuff.